Merrimack Rep Presents "The Ultimate Christmas Show (abridged)"
Presents "The Ultimate Christmas Show (abridged)"
Festive, family-friendly fun is on the menu as the Three Wise Guys of the Reduced Shakespeare Company send-up and celebrate favorite winter holiday traditions in the new comedy "The Ultimate Christmas Show (abridged)." Written and directed by Reed Martin and Austin Tichenor, the production will receive its East Coast Premiere at Merrimack Repertory Theatre in Lowell from November 25 – December 18. Having reduced the history of America, the Bible, the world of sports and more, the Reduced Shakespeare Company is back to take audiences on an irreverent but heartwarming trip through the holidays -- which will no doubt never be the same. • Learn how Santa saved Christmas! • Sing the Ultimate Reduced Christmas Carol! • Celebrate Hanukkah, Kwanzaa and Saturnalia! • Gasp at the shocking history of our best-loved Christmas traditions! 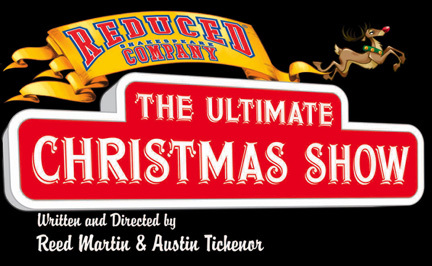 The cast of "The Ultimate Christmas Show (abridged)" features Reduced Shakespeare Company members Reed Martin, Austin Tichenor and Matt Rippy. Tichenor commented, "We're thrilled to return to MRT for our fifth visit in ten years, and this time for the holidays. We know that time is short around the holidays, that's why we set out to create the only Christmas show you'll ever need to see. We'll put the 'reverence' in 'irreverence'!" Merrimack's Artistic Director Charles Towers added, “I saw a workshop of the production in California earlier this fall and I have to tell you, it’s very, very funny! 'The Ultimate Christmas Show (abridged)' may not be for the strictly pious, but it is for everyone else who likes a good-natured laugh during the holidays." Since its 1981 origin as a pass-the-hat act in California, the Reduced Shakespeare Company has created seven stage shows -- including "The Complete World Of Sports (abridged)," "Completely Hollywood (abridged)," "All the Great Books (abridged)," "The Complete History of America (abridged)," "The Bible: The Complete Word of God (abridged)" -- two television specials, several failed TV pilots, and numerous radio pieces – all of which have been performed, seen and heard the world over. The company’s itinerary has included stops at The White House, Kennedy Center, Lincoln Center, London’s West End, Seattle Repertory Theatre, American Repertory Theatre and Montreal’s Just For Laughs Festival, as well as performances in Israel, Australia, New Zealand, Hong Kong, Japan, Malta, Belgium, The Netherlands, Singapore and Bermuda – plus countless civic and university venues throughout the USA, Great Britain and Ireland. The RSC won the prestigious Shorty Award and has been nominated for an Olivier Award in London, two Helen Hayes Awards in Washington, DC, the SF Bay Area Theatre Critics Circle Award, and several podcast awards. November 1, 8, and 15 at 7:30 p.m. Audiences may stay after the performance to learn more about the performance and chat with the actors. November 26 at 8 p.m.
November 27 at 7 p.m.
November 30 at 2 p.m. Patrons are invited to enjoy complimentary cookies and coffee in the lobby before the show, courtesy of Brew’d Awakening Coffeehaus. For tickets and information, stop by the box office at 50 E. Merrimack Street in Lowell, call 978-654-4678 or visit merrimackrep.org.